Why so serious? How advertising can show a human side. Do they know its Christmas time at all? Well, given that it’s JULY, they’d be very much mistaken if they did. But no, what did I see to wake me from my sleepy stupor on my commute this morning? 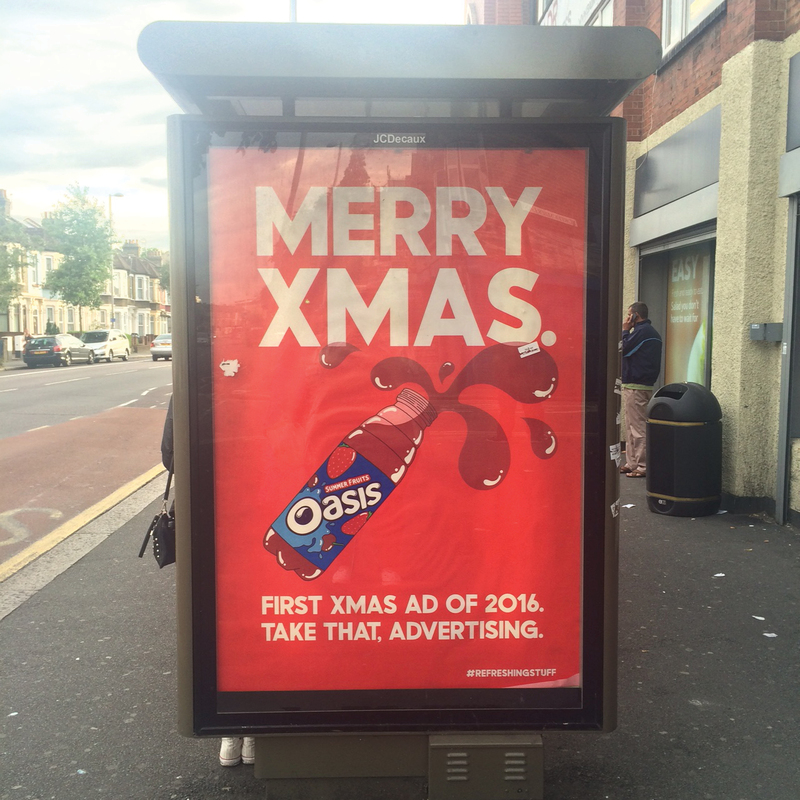 A lovely big advert from drinks brand Oasis celebrating Christmas. In fact, they’ve even crowned it the first Christmas advert of 2016. Don’t get me wrong, the retail calendar is completely different to the rest of the universe, and I know that the minute it hits April interns around the country will be hunting down Christmas trees and fairy lights in order to recreate that perfect family day, but to openly advertise about Christmas this early might seem a little unnecessary. But maybe Oasis has got it right. I mean, it’s been annoying me all day, I’ve shared a picture on Snapchat… hell, I’ve even sat down to written this article, so maybe their apparently atrociously mistimed advertising campaign has worked. I still haven’t bought an Oasis though. Not because I don’t like them but purely out of principle. Take that! 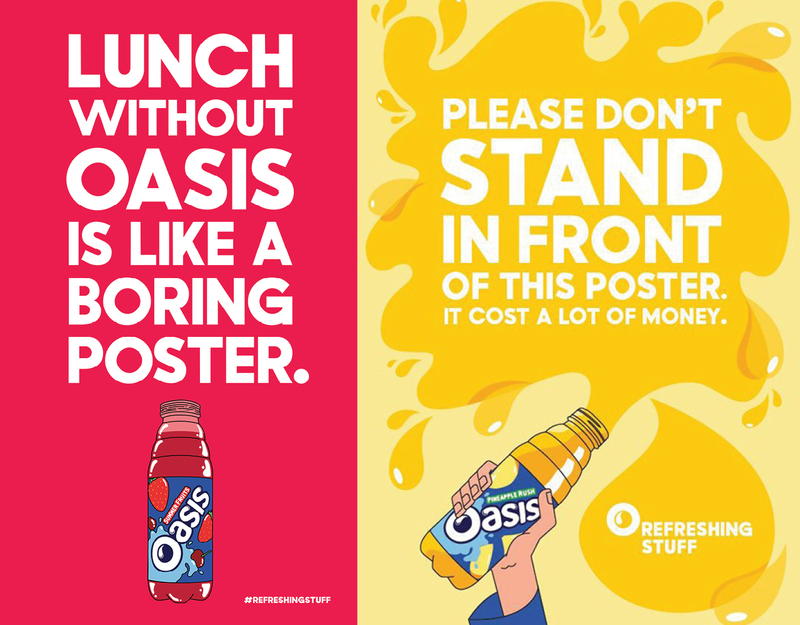 Now to be serious (unlike Oasis), the “O Refreshing stuff” campaign was first brought out in 2015, taking a humorous look at the world, using bold illustrations and specifically targeting those under 20. Bringing it back in the current climate may have genuinely been the cleverest thing they have done. These guys aren’t worrying about whether their drink is seen as a serious brand, instead care much more about making people smile and remember their drink next time they are in Tesco. Considering we have left the EU, David C has left Number 10 and the FTSE isn’t doing to well, maybe we should look out for more positive opportunities. Brands can utilise the fact that people are looking for a little happiness and maybe even a bit of nostalgia in current climate. This is exactly what we’ve aimed to do with brands like Brighton Pier and Agent’s Army, where just looking at the design puts a smile on your face. As for Oasis, traditional marketing campaigns have focused on logical, marketable strengths, benefits, and the ability to beat or be better than their competitors. Transparency, however, and a willingness to point out a weakness, builds trust in a brand. Considering the target market is a generation made of people with incredibly short attention spans and nomophobia, it really is a good test of knowing your audience. Research consistently shows that brands that do well online adopt a human approach: a personality for the brand that is actually believable, reminding the audience that there is a person sat behind the screen writing the things they are reading. Replying to these interactions, however, is equally important. Whether a brand is liking images, retweeting, answering questions or posing their own, it is key to a good campaign for this generation. No longer do you take to a piece of paper or even open Microsoft Word to write a complaint, but instead go straight to Twitter and Facebook. There needs to be people behind a brand that believe in it and know the correct tone of voice to use. Whether its #Orefreshingstuff being emblazoned across these incredibly honest adverts or social media content creation, it’s the responsiveness that matters most. Brands that want to survive online should make sure that they are available to their customer. Then, and only then, will they survive.